Author: Campion, Joan Set In . . . Description: IT COULD BE THE ADVENTURE OF A LIFETIME…IF SHE DARED. 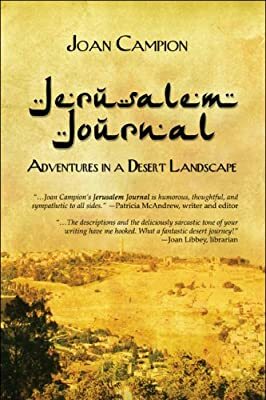 All her life, Joan Campion had been fascinated by the Middle East—its rich history, its great faith traditions, the tensions that divided its many peoples and often threatened the peace of the world. But there seemed no chance that she would ever experience the life of that place. Victim of severe nervousness which only decades later was diagnosed as Attention Deficit Disorder, she stayed close to home. Meanwhile, she read everything she could find about the Middle East and the forces that had shaped it. She even studied Hebrew at a local synagogue—and would have studied Arabic, too, if she could have found a place that taught it. Then, out of nowhere, she was offered a chance to go to Jordan and Israel. Alone. Jerusalem Journal is about what happened when she accepted the dare.